Browse: Home / Post a Comment! This is the former home of the Power Stoplight discussion board. Discussions are now located on Facebook at the Power Stoplight Facebook Page – join the conversation today! Power Stoplight is an optimal way for consumers to take control of their own electrical usage. This is a fantastic resource that is already making a big difference in our home and is teaching us how we can lower our personal carbon footprint. Thank you for bringing this to the marketplace in such an easy and efficient manner! Neat app. Can you get the data for S. California? Hi Jeff. Excellent question – that is actively under development. We will let you know ASAP! Just Announced! Power Stoplight now supports Time of Use programs for four regions in California: San Francisco, San Diego, Sacramento and Santa Monica (Southern CA outskirts of L.A.). Each region has a unique schedule that Power Stoplight follows and conveys, allowing for complete understandability on the user’s part. New version is very easy on the eyes – the “image enhanced” charts are incredible! I am sorry but I do not understand how this app can save me money. Knowing when off peak hours are is nice to prevent brown-outs but my dishwasher and Oven both use the same amount of energy whether its at 5pm peak or 2 am off peak. Also, if I were one of the few that had a wind turbine generator, I would, like all others, have it running ALWAYS. Granted, during my off peak usage that power generated would go back into the grid. But either way the power generated would be the same. Please help me understand how this would reduce my power consumption. Hello Mr. LaTraille and thanks for your questions and comments. You are correct – Power Stoplight is not aimed at reducing users’ power consumption (total kW-hr used) but at reducing their bills & environmental impact through intelligent management of their home appliances and systems. But that same dishwasher energy usage at 2AM, let’s say it’s 1.5kw-hr, at a time when electricity costs 3cents/kw-hr as opposed to 5PM when it might have been 9cents/kw-hr would end up costing you 9 cents less (since 1.5kWh*[9c/kWh-3c/kWh]=9cents) – those kind of practices could easily add up to many dollars on each monthly bill! Again though, those would be Chicago consumers on their region’s residential dynamic pricing program, one of which may be available in your area too. Please follow this link or check with your local utility to find out, compare to the flat rate system, see if it’s right for you, etc. In many programs’ cases, the utilities quote approximate monthly savings of 20% by consumers’ intelligent energy usage at non-peak times, compared to fixed rate programs charging prices such as a constant 10cents/kW-hr. As far as generation systems go, many generators find it beneficial to take their systems off-line from time to time for maintenance. Or in the case of solar panels, to cover them for protection from debris, snow and dirt, which can damage or greatly reduce the efficiency of these systems. Even better though, some home energy generators also get paid for the energy systems’ contribution back to the grid based on the dynamic prices applicable in their area. This means that at peak price times, those solar panels and windmills can earn their owners significant money as well! I live near Chicago, and am on the ComEd RRTP program. Your graph for final prices in red is incorrect, which I believe are an hour behind. The price you show, for example, between 12 Noon and 1:00 PM is actually the real-time price between 1:00 PM and 2:00 PM. Hello Mr. B. and thank you for posting your comment here. I see your point about the misleading nature of the final prices’ positions relative to how they’re shown for your program, but they are actually correct. ComEd tells you your program’s final prices for each hour using an “Hour Ending” terminology, so that “Hour Ending 1PM” slot really does mean 12-1PM. For Power Stoplight’s plots we actually put some good time and thought into implementing that 1 hour shift so that the 5-minute, Smart, and Final Prices all overlay onto the same time slot for which they apply (as in the plot in the above image). OK. I have just checked out my RRTP bill details for November, and I agree with you. The “hour ending” say, 2:00 PM means the hour between 1:00 and 2:00 PM. So the “Today” price for “the hour ending 0” (in their “Today” table), is the price we pay for the last hour of YESTERDAY. I apologize, and now agree that your iPhone app has a red line that is in fact correct. Sadly this won’t work in Hawaii, but it has potential. Aloha and thank you for your comment, but can you provide some information about a dynamic pricing program in Hawaii that could be supported by Power Stoplight? Specifically, which island and what are the name & website of the power company? Mahalo! So I love powerstoplight, have it on my Blackberry. Today though, the prices aren’t what they are on line. On my phone it currently has 1.89 this hour and 1.88 next hour but on-line, powersmartpricing.com, the prices are 3.2 and 3 for next hour. I’m assuming powersmart pricing is right but why the difference? Thanks for your comment, Michelle! The Power Stoplight server is presently under maintenance, so for the time being please refer to the powersmartpricing webpage for your pricing info. 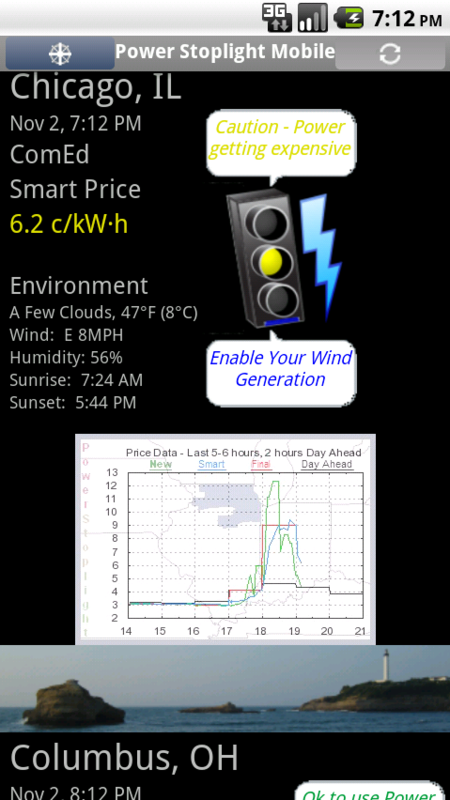 However, after this issue is resolved (hopefully within the next day), if you or other users would like access to the Android and iOS apps’ jpg plot of price data for a given day, email info@powerstoplight.com for this link. Please be sure to specify your city, state and power company. Update- server upgrades complete – all is well! Hi, Ontario has recently amended it’s off-peak times to begin 2 hours earlier at 7 pm (from 9 pm). Thought you might like to update the app. Thank you Noah! The app is updated now to indicate the start of Summer Off-Peak hours is as you say 7PM, no longer 9PM. Your message is greatly appreciated!